The hardware for Budapest's bike-share system, Bubi, will be installed in the city centre this month. Bubi’s 1000 bikes and 76 docking stations are being tested at a warehouse in an industrial area of the Hungarian capital and will soon be installed in the city centre. The Budapest Transport Center (BKK) promises that after a short testing period, Bubi will open to the public in April. Managers of the Bubi system stress that the system is meant to extend, rather than compete against, the city’s existing network of metros, trams and buses. It is hoped Bubi will boost overall patronage of public transport. Bubi will be accessible to those with a specialised smart-card Bubi pass or with a daily ticket. 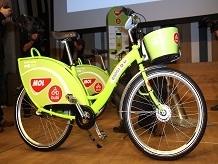 With these, users can ride up to half an hour for no extra charge. After that, a time-based charge kicks in with the purpose of encouraging short, utilitarian trips and high turnover of the bikes. The capital investment for Bubi, under development since 2009, will be 90 percent covered by an EU subsidy of 900 million Hungarian forint (€3.1 million). The city recently signed a sponsorship deal with the Hungarian gas and oil company, MOL, which will cover approximately half of Bubi’s 250 million Hungarian forint (€800 000) annual operating costs. The bicycles are made by local manufacturer Csepel.